Puppy training can be fun. Puppy training can also be exasperating! When you think about it, there’s an awful lot to teach a puppy. And if you’re going to do it right, you need to pack a lot into 8 short weeks. Assuming you get your pup when he’s 8 weeks, you have only another 8 weeks to socialize your pup while the socialization window is still open. Puppies are able to learn and explore and build positive (and negative) associations very rapidly for the first 16 weeks of their lives. Because they’re with their breeder for the first 8 weeks, that leaves us with those final 8 weeks. And if you’re not sure what your pup needs to see, heart, learn, do, and experience, it can be overwhelming. Well, really, even if you do know, it can still be overwhelming because that’s an awful lot of stuff to put on your to-do list! 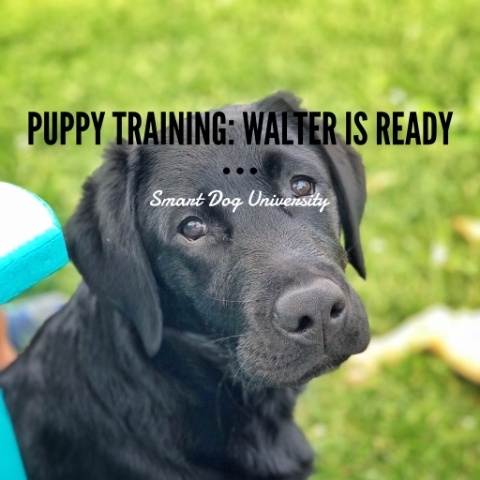 Walter’s people knew they didn’t have the time or the know-how to raise the puppy they really wanted: a happy-go-lucky guy who would have some basic manners, be house trained, and could go with them to all the fun places and do all the fun things. That’s where I came in — my specialty is puppies! I’ve raised puppies since 2001. The pups I raised were from a service dog organization and it was critical that I socialize them efficiently and thoroughly. And that I installed basic good manners behavior in those pups early (and often). When a friend suggested that I raise a pet puppy (a pup that was going to grow up to be a good, well-rounded family dog [not a service dog]), I was intrigued. I hadn’t ever considered it before. But why not? I had done it 16 times before! His people chose him from the breeder and I picked him up at 8 weeks of age. I had my work cut out for me. Walter was a scared little guy who didn’t have a whole lot of experience or socialization from his breeder. It took him a week or two to get him comfortable in his own skin, but thankfully he was a curious puppy and loved food, so I could use food to help him enjoy people and places and things. He was frightened of what I consider “everyday noises” like a plastic Solo cup being dropped, the cellophane envelopes that rattle when opened, and the noise of an empty can being tossed into the recycle bin. He was a bit timid around new people and wasn’t the stereotypical outgoing Labrador. We took it slow and easy, making sure to read his body language to gauge his ability and willingness to learn new things. After about four weeks, I was seeing a really nice transformation happening. He was much more waggy, actually pulling me to go see new people! He didn’t try to hide when I took him to the veterinarian, and he was much more tolerant of noises and new experiences. Fast forward to today and now I have to hold Walter back! He’s a social butterfly with both people and dogs, but is also quick to read other dog’s body language and back off if needed. He’s willing to trust me in new situations and looks for guidance from me if he’s uncertain. That’s the foundation that all puppies need if they’re going to continue a lifetime of learning — that foundation of quality and timely socialization, trust and cooperation with people. Now that Walter has some confidence, has had some positive experiences with novel items, and understands that he is part of the team, the sky is the limit for him! His people will be able to continue the learning that I’ve started, teaching him all the things that he needs to know to live comfortably with them as he transitions to his new life. People always ask if it’s hard for me to let a dog go that I’ve had a hand in raising. I do! Every. Single. Time. There are always tears. But the good news is get to watch Walter when his family goes away for vacations and travel! So he’s not really leaving, after all. He’ll be back for mini-vacations and will get lots of lovin’ from us. He’s grown into a lovely young adolescent Labrador. Who will need more training if he’s going to continue to grow into the dog this family has dreamed of. He’s a teenager and will need guidance and reassurance as he continues on his path of learning. 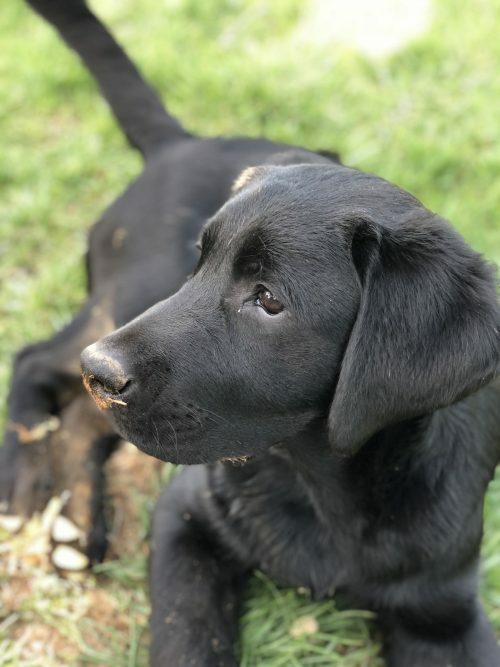 He’s gotten a good start, though, so any challenges that he faces will be handled more efficiently and effectively using the positive and cooperative training that he’s learned.